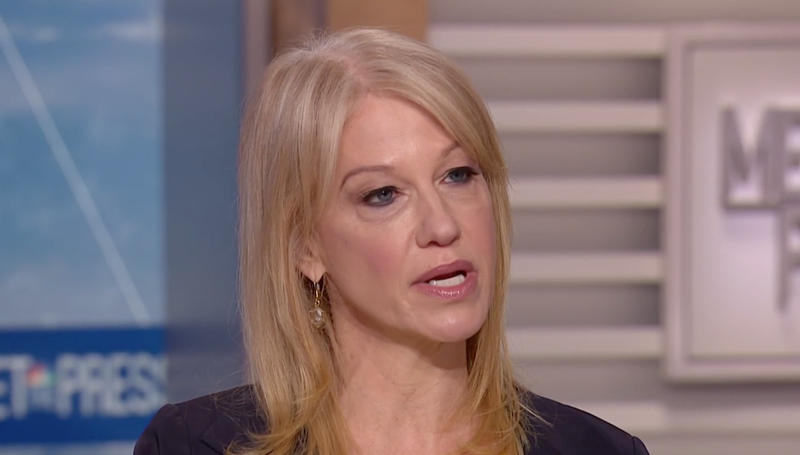 During a Sunday interview on Meet The Press, White House counselor Kellyanne Conway appeared to question why migrants seeking asylum in the United States don’t “wait in Mexico” while their cases work their way through the overloaded immigration system. Her remark came during a nearly 15-minute interview with NBC host Chuck Todd, in which Conway repeatedly deflected criticism that President Donald Trump’s rhetoric had inflamed and worsened the debate over immigration policies. “It’s safe passage for those families and unaccompanied minors,” Conway added, referring to The Migrant Protection Protocols program, brokered between the U.S. and Mexico. Intended to repel migrants from Guatemala, Honduras, and El Salvador, the program marks a sharp departure from how the U.S. has long processed asylum claims. Under the plan, migrants who enter the U.S. from Mexico seeking protection are supposed to be given a U.S. court date no longer than 45 days after arrival, but are forced to remain in Mexico during that period. According to the Department of Homeland Security, The program was introduced as a way to stem the flow of immigrant families and others whose cases could not be easily decided. Critics, meanwhile, have decried the shift, arguing that it creates a logistical nightmare that dumps responsibility onto Mexico and convolutes interviewing requirements. There is currently a backlog of over one million cases in immigration courts, meaning some migrants must wait years for their cases to be concluded, according to Syracuse University’s Transactional Access Records Clearinghouse, which tracks data from immigration courts. It also raises a considerable moral dilemma about turning away migrants who genuinely fear for their lives. In February, numerous civil rights and immigration advocacy groups filed lawsuits to halt Migrant Protection Protocols from continuing, citing those dangers. On Friday, a federal appeals court judge ruled that the Trump administration could temporarily continue with the program. Elsewhere in the Meet The Press interview, Conway appeared to brush off a New York Times report that stated Trump’s fiery rhetoric about immigration had resulted in a surge of people attempting to cross the border. "Will someone tell the president that his words are actually encouraging these coyotes to make money off of desperate people?," Todd asked. “Well, the coyotes and smugglers do that anyway. You know that,” Conway replied calmly. Watch the full interview from "Meet The Press" here. During an April 14, 2019 interview on “Meet The Press,” White House counselor Kellyanne Conway appeared to question why migrants seeking asylum in the United States don’t “wait in Mexico” while their cases work their way through the overloaded immigration system. Screengrab/"Meet The Press"